Friends and family flooding into and out of Champion are readying for the feasts and celebrations of the season. Hopes are for everyone to be safe on the road. It is a dangerous place at best, with people thinking about the smells of pot luck dishes flooding the car, who they will see when they get there, things left undone at home and myriad other things. Subtle color changes and damp pavement winding through dense woodlands and open fields with turkeys and bald eagles perched high and ready, the very definition of equipoise, and the possibility of deer appearing out of nowhere at any time, make giving attention to the road an exciting and challenging prospect. Mix that concept with conversation and/or music and a driver needs to pay attention. Arriving safely is plenty of reason to be thankful—turkey or not. Linda’s granddaughter is Danniel. She just had her 20th birthday back on November 7th. It is amazing that the years have gone by so quickly. Linda has kept her sweet friendly smile and has maintained a good close relationship with the lovely Danniel. Deward’s Daughter, the fair Marian, has just had her 85th birthday. TCN has Marian to thank for “Looking on the Bright Side!” She said that her dad had that good kind of attitude and passed it on. She said he would talk about Champion as ‘the village.’ The Village of Champion wishes Marian a great day. She is probably being overrun by cousins, daughters and the like. When Champions see eagles, they think of Marian, because she is a real fan of the National bird. South Champion Sue is reported to have been ‘Sue t’ bly’ celebrated on her day, the 23rd. Brava! Skyline fourth grader, Jhonn Rhodes, and first grader, Lane Watkins, share November 30th as their birthday. They are fortunate to each have several years ahead of them at this fine institution. Danniel is studying to be a teacher, Sue taught math, and Marian taught fourth grade for many years. The Skyline R2 School is one of those precious little rural schools that define the heart of this community. What a gift it will be to them in the future to be able to say, “There were eleven people in my fifth grade class.” The good stuff is going on for them right now. By the way, if you are headed down to the ‘Bright Side,’ feel free to drop your change or some extra bucks into that fruit jar that has the little note on it about The Skyline R2 School Foundation working toward getting some modern water fountains into the school. Champion! It turns out that not everyone in Champion is connected to the internet. Some unconnected people wonder sometimes just what they might be missing. As a service to them, TCN (The Champion News) offers a transcript of some of the Facebook activity of last Friday evening. Robert Upshaw posted: “I’m proud of myself today. Some wind bag was trying to get me to believe a farfetched tale of which I don’t think there was a whole lot of truth. So I just asked him, ‘Do I have stupid written of my forehead?’ That pretty well shut him up. All he said after that was, ‘Ha! Ha! That wouldn’t be necessary,’ as he walked away.” By 9:39 Linda Clark, Loretta Upshaw, Elva Upshaw Brott and 21 others had ‘liked’ this. Tracee Davis said, “LOL.” (Laughing Out Loud). Kristi Towe said, “Lol!” (Laughing out loud). Sami McCleary said, “Lol now Robert did you visit Champion today?” Brenda Coffman Massey said, “lolol.” Rusty Ingram said, “Way to go Robert Upshaw.” Lynnette Cantrell just laughed, “hahahahhaha.” Cathie Alsup Reilly said, “lol.” Brent Nunn said, “You got the best of that guy. It got me thinkin, though, if anybody really has that on their forehead, and I looked in a mirror, just in case. I’m probably OK, although I can’t read anything backwards.” Connie Klund said, “Ya got him didn’t ya…” Debbie Stone said, “Robert, you’re such a quick thinker! Haha.” Sylvia Williams McClellan said, “You weren’t talking to yourself were you?” Robert Upshaw then said, “I used to ask myself questions, but the answers were so complicated I couldn’t understand them.” Sylvia Williams McClellan said, “I figure that’s how I get the best answers.” Brent Nun said, “Been known to argue with myself, and lose.” River Stillwood said, “You really told him, Mr. Brilliant!” Jewell Hall Elliot said, “Go Robert!! !” then “Oh, I forgot Go Robert Earl! !” Tom Culler said, “…you must have been talking with someone who ‘works’ in Washing D.C., Bob!” (A sad emoticon appears next. It is just a combination of punctuation as in “:(”.) And Virginia Canada said, “Ha! Ha!” All this transpired over the course of two or three hours but references to it will probably go on for a day or two. Scrolling on down, a person can see somebody scratching the belly of a tiny pig and then there might be a little video of The McClurg Jam. In the middle of many of other things the next day was this: “I’m thanking River Stillwood at the Vanzant Country Store in advance. She is going to make a little plague for my forehead which will read, “STUPID DON’T LIVE HERE ANYMORE.” She thinks, for my best interests, I should wear it 24/7. Again, Thanks, River.” To end this extraordinarily long paragraph, do you folks without computers think you are missing much? Ms. Anne Thrope writes in as if TCN is her personal soap box. “You Liberals think you’ve won this Keystone XL thing, but you are in for a fight. They’ll not give up on this. The Koch brothers have mountains of money you cannot imagine that they will throw at this thing until people are so tired of it that they will forget to care. Nobody will spend a dollar or a minute to remind people about the Mayflower oil spill in Arkansas. Didn’t hear about it? Surprise, surprise! Everybody was so warped out of shape over Benghazi and the House of Representatives has just issued its report that says it was a non-deal. Come on people! Are we foxes or coyotes?” She did have some nice things to say about those old hippies Neil Young and Willie Nelson out there in Nebraska giving concerts and support to the farmers and Native Americans. Perhaps she will explain the foxes and coyotes in her next rant. Feel free to join the discussion at champion@championnews.us or in person around the big wood stove. On Wednesday a visitor to Champion met up with Dave Partell, who responded to, “How you doing?” with, “I’m too blessed to be stressed.” That seems fine. As the morning passed more regular Wednesday folks arrived…Ethel and Bob Leach were looking good and seemed to be comfortable with the weather and the things that change with their regular chores as a consequence. The first week end of regular deer season resulted in the harvesting of 1,000 deer in Douglas County. There are reports of some exotic game in the area as well. Stay tuned for more information about this. The population of the area is about to be boosted as Peanut Teagan-Super-Girl is about to be a big sister. It is very exciting to be a resident of the Village, at the bottom of several hills, at the end of the pavement, on the wide, wild banks of Old Fox Creek. Sing your favorite song of thanksgiving out on the spacious veranda of the Historic Emporium. “Saddle me up a big white goose, tie me on her and turn her loose! Oh! Me! Oh My! Love that country pie!” Every day is full of Thanks giving in Champion—Looking on the Bright Side! Sunday‘s dusting of snow was just enough to decorate each leaf in a way that made its shape more defined and the stresses of the cold on their colors precipitously invisible under the perfect garnish and it all looks clean and cool and perfect—like spring, but white. Sycamores, white in colonnades along the creeks, are a conduit between snowy earth and sky. An early entry to winter has Champion busy with preparations and plans for a snug few months ahead. “What’s all this nonsense about global warming when we are so cold?” The Old Champion replies, “Global warming is not climate warming. It causes climate change, which will make it warmer or colder, wetter or dryer, depending on your location. We’ve been colder than Alaska this week. What climate change brings with it is extreme conditions.” Champions are ready for whatever comes. “The great thing about getting older is that you don’t lose all the other ages you’ve been.” So said Madeleine L’Engle. She was born in November of 1918, and lived until 2007. She wrote poetry, plays, short stories and novels, including “A Wrinkle in Time.” She has a number of quotes about birthdays. Jill Sterling’s birthday was November 13th. She was just in the neighborhood from Tulsa. Representing the Inconvenient Minors, she sat in on the regular Fortnight Bridge game on Saturday down at Vera Cruz. Susan Needham (Southern Champion grandmother of Seamus, Zack, and Elizabeth and astute political observer) has her birthday on November 23rd; Waylin Moon (Skyline 8th grader) has his party the 24th; Skyline second grader, Faith Crawford, shares her birthday with super-teacher, Lannie Hinote, on the 26th. W.A. Marsters (born Richard Masters in 1831) was an English adventurer who settled on Palmerston Island in the Cook Islands in 1863. He died in 1899 at the age of 67. He had three wives, 23 children and 134 grandchildren. W.A. Masters, farmer, born in Frog Level, Oklahoma in 1914, had his birthday on the 27th. He was the survivor of twins, father of three, a one man band. Alyssa Thornhill is a Kindergarten student with a birthday on November 28th, Ally Smith, third grader and kindergarten student, Billy Strong, share the 29th. All the ages we have been are worth celebrating. Cinita Brown from way across town has written in with a story about Cletis Upshaw. While visiting with him in his home in Norwood in the late 1990’s she was pleased to find photographs on his wall of most of the early, east end Douglas County men who made history. She inquired about a familiar looking one and Cletis answered, “Girl, that is old Robert Hicks, the first representative of Douglas County.” Later she and Kenny Brown went back and scanned Cletis’s photo collection which she says she will be happy to share. TCN (The Champion News) is currently working on a page for the website dedicated to Cletis and will be pleased with Ms. Brown’s good input. Share your Cletis stories and pictures at champion@championnews.us or by snail-mail at TCN, Rt. 72 Box 367, Norwood, MO 65717. The gentlemen from the east end Douglas County road shed have been busy down in Old Fox Creek. They have a bucket loader down by the bridge and have been working the creek bed with the purpose of having water flow under the bridge and not over it. Accomplishing routine and deferred maintenance is a way to keep things moving smoothly. Angela Souder and Melissa Lang of the Douglas County Health Department will be back in Champion from 9:00 a.m. to 11:00 on Tuesday the 25th. They have probably already saved at least one Champion life with their blood pressure checking device. Last month there were prominent citizens, and prominent girlfriends, cowboys, old timers, new-comers, some regular loafers and drop-ins who took advantage of the amenity. Come down to the Recreation of the Historic Emporium on the north side of the Square any day and enjoy real community. Country music star, Lynn Anderson’s song “Top of the World” says, “Such a feelin’s coming over me/ There is wonder in most everything I see/ Not a cloud in the sky, got the sun in my eyes/ And I won’t be surprised if it’s a dream” … or Champion—Looking on the Bright Side! It is hard to go anyplace in Champion for needing to stop every whip stitch to snap a photo or to gawk at a new view or to study something along the road closely. A loose cow or horse in the road or a truck and trailer broken down blocking the way, maybe a neighbor out of gas and needing a ride—there is no end to what can get in the way sometimes. Some missed Skyline’s Auxiliary meeting on Wednesday, but heard that it had been a most productive session nonetheless. Sometimes obstacles and complications are just a way to extend the enjoyment of the journey the Champion way. Veterans and all those who serve the Nation are much in the thoughts of the world in these days leading up to the observance of November 11, 1918, as the end of “the war to end all wars.” Sadly, it did not work, by the 1930’s the world was in an uproar again. Some say there has never been a time in the world when there was no conflict anywhere. Throughout history, violence has been observed in every human society. Some say the best way to honor a Veteran is to not make any more. World leaders and power hungry zealots are not likely to buy into that way of thinking. For those who sacrificed themselves to the noble causes, the dedication of the Garden of Remembrance goes, “They shall not grow old/ As we that are left grow old/ Age shall not weary them/ Nor the years condemn/ At the going down of the sun…/ And in the morning/ We will remember them.” The census report in 2013 revealed that there are 19.6 million military veterans in the United States, 3.6 million of them have service connected disabilities and 14.7 million of them voted in the 2012 election. That is seventy percent. Veterans make good citizens. They are family, friends and neighbors who have earned the respect and gratitude of the Nation. Shake their hands and thank them for their service. They are Champions. Election officials say that Champion and the two other townships that vote with it were able to muster a total of 253 votes on November 4th. A West-End Friend shared an interesting article from the Christian County Headliner News about the Ava/Barker Saw. One of the gents from the Older Iron Club out of Cabool takes one of these amazing machines down to the Pioneer Gathering every year and demonstrates its power and relative flexibility. It was the precursor of the chain saw and quite an innovation for the time. Reading the history of the saw is like a ‘who’s who’ of Vanzant and Ava with names like the inventor, Albert P. Smith and his son, Ivil, William Isam Barker, Doc Sallee, Elmo Hartley, Paul Barker, Noble A. Barker and his son Noble G. Barker. The first saw came off the line in 1947, and over the course of time the business changed names and ownership and eventually became the property of Homelite in the mid 1950’s. A few of the original saws are still working, and many are in parts in junk yards, like the West-End Friend’s own. The article says there were approximately 1,000 Ava Saws and more than 2,000 Barker Saws manufactured and sold. Probably some were sold in Ava Lumber. Many remember Kris Kottmeier, who passed away recently, as being that handsome, smiling guy in the family lumber business. Among his belongings was a pristine brochure for the Ava/Barker Saw which his sister, Susie, shared with his friend. Mementos, souvenirs, keepsakes are all reminders of friendships, kinships and the swift passage of time. Apparently Loretta Upshaw and her dad, the General, took a flight of fancy and wound up in an airplane with some guy (Ray Davidson) who was flying the plane. Loretta posted some great pictures. They were flying over Vera Cruz and Robert Upshaw said, “This meadow is where the county seat of Douglas County was at before, during, and after the Civil War. A battle took place here in November 1862. There is a small cemetery less than 40 yards from the right point of the meadow. Cathie Alsup Reilly has ancestors buried there. Present day Vera Cruse is about three miles downstream (to the left) on Bryant Creek.” Then Cathie Alsup Reilly said on line, “Cletis was so very happy the day we made it to the grave sites. He had never been there before and didn’t know about the graves. I had made plans for Cinita and Logan Brown to lead us there once I discovered the location. The Eagle Scouts back in the 60’s had built a rock wall around the area of the graves in order to try to preserve it. Cletis never got to go back and actually had a rough time walking to the area that day even though it wasn’t far from where we had to leave the truck. A nice young man had him sit on the back of his 4 wheel drive and drove him right to the site. Cletis talked about the visit many times after that, and the month before he passed he asked a special request of me concerning the site. Robert Upshaw helped me carry that request out in May of the next year. Jeremiah Coats is buried there along with other family members. Jeremiah was mine and Cletis’ great grandfather. “Cathie said that Cletis was a walking encyclopedia of the area, but this part of the family history was new to him. Champions miss Cletis. He was a Veteran and a real native son. 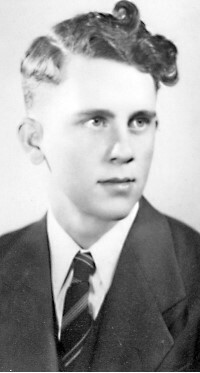 Cathie has shared some pictures of him in his youth and later years that will be posted on The Champion News website at www.championnews.us. Anyone with a story to tell about Cletis is encouraged to email it to champion@championnews.us or mail to TCN, Rt. 72 Box 367, Norwood, MO 65717. Ms. Ann Thrope writes again and says that through her “perspectacles” she sees that when we aggrandize patriotism and celebrate militarism we are not honoring the dead of war, we are enticing the living to join them. Pretty much everything she has to say is negative. She could stand to spend some time with her cousin, Phil N. Thrope, and maybe some of his generosity of spirit will rub off on her. A person can hear all kinds of things, but it turns out that some folks live so far back in the sticks that they do not get AM radio. There is something called the Cracker Barrel somewhere out on the airwaves, and a guy named Brushy Knob John, is making fun of a prominent Champion, calling him “Rumpletaterskin” figuring he is spinning potatoes into gold. Add your malarkey to the mix around the wood stove at the Historic emporium. It is fixing to get cold. Darrel Haden wrote, “Winter: a hardening of the year’s arteries, when blue cold is blown out of snowbanked skies. But winter is also a warm time of holidays, friends, and firesides.” Champion—Looking on the Bright Side! Even with plenty of warning, abrupt changes are surprising. Wood smoke perfumes the hollows and all that brilliant, glorious color is muted to mostly brown now with only a little gold hanging on. Just last week a Champion wrote, “The breeze has picked up and from flash to twinkling the air is filled with yellow leaves looking like a mass migration of something magic.” The cold descended on Halloween making it somehow more spooky. Linda Clark reported a while back that she was alone one night reading “The Headless Cobbler of Smallett Cave” on the www.championnews.us website, when an unexpected noise erupted somewhere in the house gave her a start and a faster pulse. She laughed about it and also laughed about slipping on some slick leaves, taking a tumble off a bluff and going on a roll down the hill. She says she is ok but sore from head to toe. Best wishes from your Champion friends. A great friend of The Champion News, Walter Darrell Haden, will be buried in the Spring Creek Cemetery on Election Day. He cut a dashing figure around Ava in his younger days and moved on to a PhD from Vanderbilt University and a 37 year career as an English professor at the University of Tennessee. “The Headless Cobbler” and “All the Late News from the Courthouse” are a couple of his pieces that are familiar to people in this neck of the woods. He wrote “When Winters Were Long, The Tales Taller” for the White River Valley Historical Quarterly (Volume 4, number 8—Summer 1972) which is available on line and probably in the local library. He was active in country music and folklore associations and was considered the academic last-word concerning the history of traditional music. He wrote the definitive biography of Vernon Dalhart, a fascinating individual who was the first country music recording artist to attain a following for himself and commercial country music. Portions of the biography appear in “Long Steel Rails: The Railroad in American Folksong,” an anthology by Norm and David Cohen. He came from a family seeped in old time music. Charlie Haden, who passed away this year came from the same roots and began his career playing on the radio with the Haden Family Band. He later migrated into jazz where he found great success and in later years came back again to bluegrass. In a note that came with a gift of a CD called “Beyond the Missouri Sky” on which Charlie collaborated with guitarist Pat Metheny, Darrell wrote, “Charlie’s grandfather, Homer Fielden Haden and my grandfather, Walter Dewitt Haden (1876-1961), grew up together in Smallett. Their fathers were father and son while their mothers were sisters.” They sound like Champions. Darrell and his wife, Betty, visited Champion in 2007, while the original store still stood. He was a regular correspondent from the time this version of “Champion Items” first appeared and his encouragement has been priceless. Condolences go to his family as we miss one of their brightest stars. A number of stalwart Champions showed up on the last Tuesday of the month to take advantage of The Douglas County Health Department program to provide free blood pressure readings and other health screenings to local residents. Angela Souder was back again and this time had her “lung age” machine with her. A 75 year old Champion who smoked for 30 years and quit smoking 20 years ago, who took a turn fighting fires for the conservation department and who still heats with wood was pleased to learn that his lungs are only five years older than the rest of his body. Angela had help this time provided by a third year nursing student, Melissa Lang of Seymour who is learning the ropes of being a rural health care provider. Melissa is familiar with the area and will be welcome back any time. 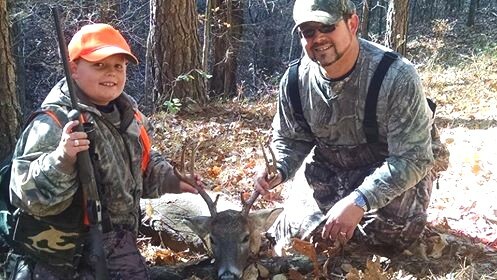 Foster Wiseman was out early on Saturday morning with his dad on the opening day of the youth deer hunting season. They arrived before daylight and found their blind. (Foster says all the trees look alike in the dark.) By ten o’clock he had his 8 point buck. 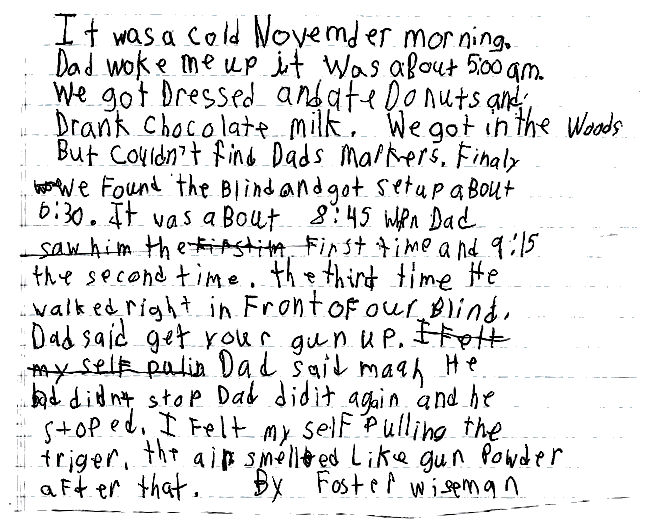 The details are exciting and Foster has agreed to write them himself for publication here. Look for it soon. Birthdays are a big deal and there are many to celebrate in the week ahead. Elijah and Arjuna Flenner (now in their 40’s) celebrated on the first of November; Kellie Perryman, Skyline 3rd grader, on the 3rd together with counselor Mrs. Beeler; another 3rd grader, Hailey Hall, on the 4th; Emerson Rose Ogelsby (Champion granddaughter) on the 5th; Sharon Upshaw (Mrs. General) on the 6th; Kathy Barns (Linda’s sister) on the 6th; Skyline first grade student, Mason Solomon, on the 7th; Bob Heffern (Grandfather Weltanschauung) of Champion South on the 8th; and Skyline second grade student, J.D. Borders, celebrates on November 9th. May beauty and happiness surround you on your birthdays and always! The Eastern Douglas County Volunteer Fire Department will have their annual chili supper and benefit auction at the Vanzant Community Building on Saturday, November 8th, with dinner starting at 5:30 and the auction at 6:30. See you there! Jeff Goss writes from Billings, MO with a report of the Christian Agricultural Stewardship Conference that was held there at the Vanzant Community Building on October 3rd. He says that attendance was small but the program was most informative. Vernon Kinsinger’s talk on the fascinating science of epigenetics revealed that environment and nutrition can affect the expression of genes for up to four generations. He says that means a person’s nearsightedness might be partly due to his grandmother having received an overdose of some trace elements from canning jar lids. It also means that living a healthy lifestyle will benefit yourself, your children, grandchildren and great-grandchildren. Marian Schrippe of the Ozark County Homegrown Food Project says that the Ozark Farmers’ Co-op hopes to get some university grant funding to build a tomato grading plant in Mountain Grove or possibly Vanzant. Then they will just need to find enough growers willing to raise tomatoes, which Goss contends should not be too much of a problem with Booger County’s tomato history. Jeff has a precise and legible handwriting—a joy to read. A note from Ms. Ann Trope is an emotional scrawl, hard to make out. Politics has her in a tizzy and she seems aggravated with the whole human race. In her tirade she asks, “How…how can intelligent people not see that they have the power to affect the quality of their own lives? Vote! Vote!” Her passion produces holes in the paper with her exclamation points—her penmanship expresses megahertz of volume. She is most fearful that the future of democracy in America already is in the hands of Ollie Garkey, “who, believe me!” she says, “is not promoting a progressive agenda! If a little rain shower keeps you from the polls, you will get just what you deserve! Wake up!” No return address makes Ann a mystery and by the time this is in ink the midterms will have passed and a small number of people will have made the decisions that affect everyone. Come gather round the same wood stove that has been warming Champions for generations. Spin your yarns and exchange your views. Try to remember the words to “All the Late News from the Courthouse” and the stories behind the song. While you are at it, spend a moment to marvel at the beauty and tranquility of a little spot on the banks of a creek, where country roads meet at the bottom of several hills at the end or beginning of the pavement—Champion! Looking on the Bright Side!